Are Your Vaping Coils Authentic? HomeAre Your Vaping Coils Authentic? Have you ever bought cheap vaping coils from an online marketplace or an overseas discount seller? Did the coils perform exactly like the ones that came with your tank, or did you find them slightly disappointing? If you’ve ever bought a box of discount vaping coils – and they failed to meet your expectations – you’ve discovered the reason why virtually every box of coils has a scratch-off code for verifying authenticity. Shenzhen, China has become the center of the vaping universe. You can find many, many factories there producing vaping products. Some of those factories have become major companies such as SMOK, Aspire and Kangertech. Others have names that you’ve never heard before. Those are the factories that produce clones. Are you using authentic vaping coils, or are you using clones? In this article, we’re going to teach you how to tell the difference – but first, let’s learn a bit more about why knockoff vaping products are such a great concern. Why Do Counterfeit Vaping Coils Exist? In the vaping industry – just as in other industries – there are some major brands that have built great reputations for themselves and can charge premium prices for their products as a result. Where there are premium brands, knockoffs inevitably appear. You see counterfeit products when you shop for everything from mobile phone chargers to handbags. Some of those products are virtually indistinguishable from the originals, but others may have quality control issues. A few counterfeit products may even be dangerous to use – that’s why major brands dedicate so many resources toward protecting their intellectual property. According to Business Insider, the vast majority of the world’s counterfeit goods come from China. That’s partially because China is filled to the brim with modern factories that churn out consumer goods of all types at a rapid pace. China doesn’t just produce most of our counterfeit goods – Chinese factories also produce most of our legitimate goods from ranging from clothing to consumer electronics. Many people have suggested that counterfeit products are rampant in China because the intellectual property laws there are so lax. When knockoffs are encountered, it’s difficult get justice. To whom will you serve a lawsuit if you don’t know the origin of a knockoff product? In short, counterfeit vaping coils are everywhere. Customs agents aren’t searching pallets for fake SMOK coils; they’re looking for knockoff Prada bags and iPhones. When you buy vaping coils online, you need to trust the seller. To add an extra measure of protection, though – both for themselves and for their customers – many of the world’s leading vaping product manufacturers now place scratch-off codes on their product boxes. Do you have a box of vaping coils in your hand? Let’s find out whether they’re authentic. Aspire began using a more advanced product authentication system in 2017. If you have a box with the new design, you’ll see a holographic image when you move the authenticity label under a light source. You can scan the QR code on the label or use this link to view the Aspire authenticity checker. Once you’ve reached the authenticity checking page, enter the code on your box and click the “OK” button. If you have a valid authenticity code that’s never been used before, you’ll see a “Congratulations” message. If the code isn’t valid — or it has been used before — you’ll see a warning message indicating that you might have a box of fake Aspire coils. 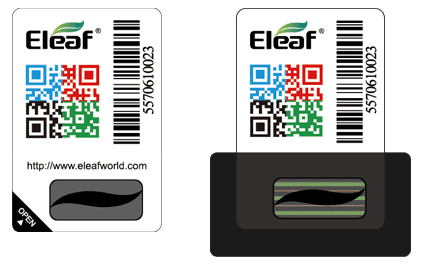 ELeaf switched to a more complicated anti-counterfeiting system in 2017. If you have an ELeaf product with the old anti-fake sticker, you’ll simply scratch to reveal the code. If you have a product with the new sticker, you’ll lift the corner of the sticker to reveal the code. Type your code at this website to confirm that you have a box of authentic ELeaf coils. If your ELeaf product has the new sticker, there is also a second way of checking its authenticity. In the package, you’ll find a small black square. Peel the authenticity sticker and put the black square over the verification code. Fold the sticker over the black square. You should see colored stripes on the ELeaf logo. If you have an ELeaf product that supports firmware upgrades, you can also check its authenticity by upgrading the firmware. ELeaf has advised that the firmware upgrade process does not work on fake ELeaf products. Freemax coils use a simple scratch-off verification system. Scratch the sticker on your box to reveal the security code. You can visit the authentic Freemax coils checker by scanning the QR code on the box of by visiting this link. If you have authentic Horizon coils, you’ll see a scratch-off code on the back of the box. Enter the code on the Horizon website at this link to confirm that your coils are real. On the box of each Innokin product, you’ll find a silver scratch-off stripe. 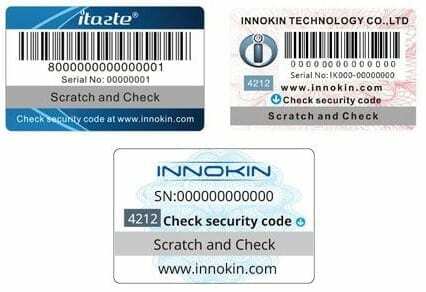 Scratch the stripe to reveal the product’s authentication code and visit the Innokin device verification page at this link. If you have an Innokin vaping mod, you may also be able to get the verification code through the mod’s menu system. Many Innokin devices will display their authentication codes if you hold the fire button, “+” button and “-” button simultaneously for five seconds. If you have a Joyetech tank or mod, the product should include a warranty card from Joyetech. The first thing that you should do to confirm the authenticity of your product is to compare the serial number on the warranty card to the number on the back of the box. If the numbers match, scratch the strip on the warranty card to reveal the product’s security code. Note that Joyetech coils may not include warranty cards. In that case, you’ll find the verification code on the box. Visit the Joyetech support website at this link to enter the code and confirm that you do not have fake Joyetech coils. 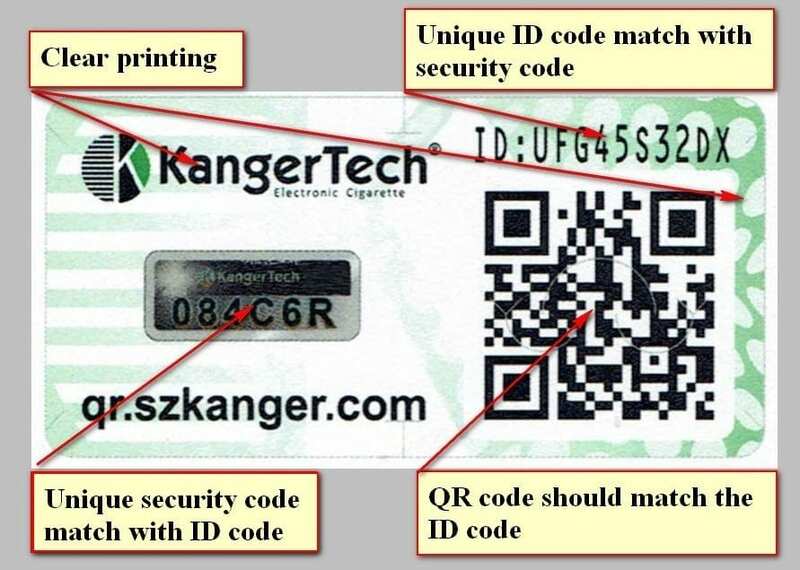 On the back of a box of authentic Kanger coils, you should see an ID code in the upper right corner of the authenticity sticker and a secondary code on the left side of the sticker. As Kanger notes on its website, the typography on the authenticity sticker should also be of the highest quality. Visit the Kanger authenticity checker at this link. Type the ID displayed in the upper right corner of the authenticity sticker. If the ID has never been used before, you should see a success message. You should also see a product security code matching the code on the left side of the authenticity sticker. 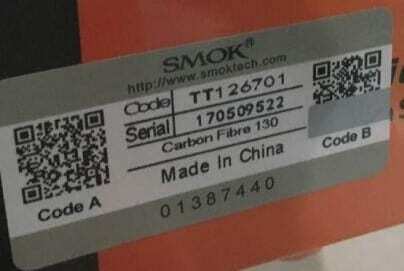 The method for checking the authenticity of SMOK coils is a little more complex than what other manufacturers use, perhaps because there are so many knockoff SMOK products in existence. One of the nice features of SMOK’s authenticity checker, though, is that it uses two different codes to verify products. You can confirm that a SMOK product is legitimate before you buy it or open the box. To begin, you’ll need to download the SMOK Vaping Tour app on your mobile device. Once you’re in the app, tap the “Security” icon and use your device’s camera to scan “Code A” on the product’s security sticker. If the code is valid, you should see a screen like the one below. To register yourself as the owner of the product, scratch off the silver strip covering the bottom portion of the second security code. Tap “Bind to user” and scan the second code with your device’s camera. You should see the message “Binding Success.” If the app displays a message saying that the first and second security codes don’t match, you should return the product for a refund. A box of UWell coils will have an authenticity sticker resembling one of the two images above. 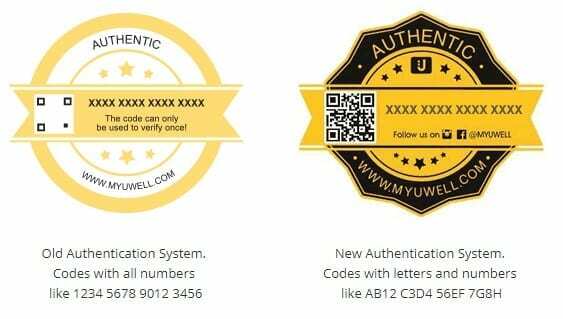 Visit the UWell product verification page at this link and click the image corresponding with the authenticity sticker on your product. Enter the verification code exactly as it appears on the sticker. If the code isn’t valid — or another customer has registered it already — you should return the product for a refund. 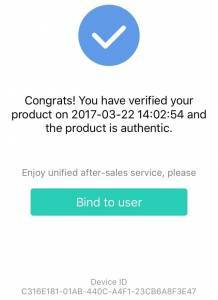 Vaporesso introduced a new product verification system in 2017. If you have a product released under the new system, it’ll have a sticker like the one pictured above. When you examine the Vaporesso logo at the top of the sticker, you should see that it appears to change in size as you tilt the sticker. 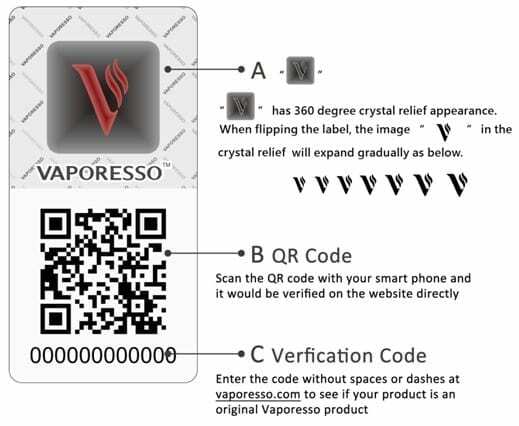 Verify the security code by scanning the QR code with your mobile device’s camera or by visiting the Vaporesso website at this link. You’ll see the code entry area under “Ecig Originality Checker” near the bottom of the page. If you have a Vaporesso product with the old scratch-off security code, you can check the code at the Vaporesso website using the same method. A Wismec product should have a security sticker like the one pictured above. To check the code, scratch off the silver bar and enter the code using the Wismec verification tool at this page.